RAG(Raise and Give) has created their first ever totaliser. 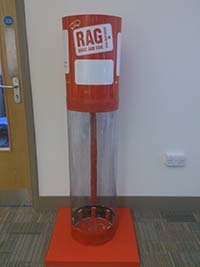 Designed to show off the hard work students do, RAG hope the new totaliser will raise awareness of the fundraising efforts in the university and motivate others to get involved. To build the Blue Peter style creation, Claire got together with the student activities department to discuss designs, before making a trip to a well-known DIY store to get materials. After two days of sawing, painting and gluing the totaliser was complete! The totaliser will be officially launched on Monday 9 December in the main SUSU reception, where it will be filled with four different coloured balls. The red balls will represent money raised by RAG, blue balls will be money by Charity Societies, yellow balls will be those by other Societies and green will be by individual fundraisers. Each week it will be updated as the different fundraising totals are revealed.